The FTD® Holiday Celebrations® Bouquet is set to send holiday cheer to friends, family and loved ones throughout the month of December! 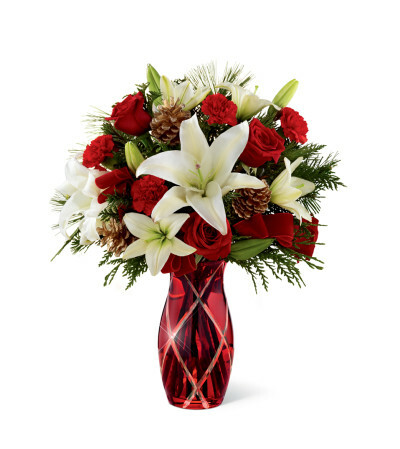 Rich red roses and carnations are beautifully arranged amongst clean white Asiatic and LA Hybrid lilies perfectly accented with lush holiday greens to create an exquisite flower arrangement. 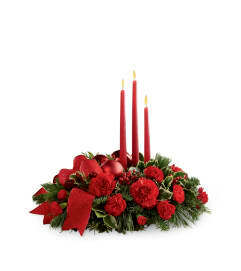 Presented in a designer red cut glass vase, this holiday flower bouquet is a warm and wonderful way to send your season's greetings to any of the special people on your holiday shopping list.